And welcome to our first post of 2019! I hope the new year has been treating you well so far. As you can imagine, the weekend leading up to February 14 and the following weekend are very busy for all of us here at Greystone Manor. Our all-inclusive romance packages are popular with not only out-of-town guests but with the locals as well. The package includes champagne and canapes upon your arrival, a couple’s massage at our spa followed by a romantic candlelight dinner in the dining room. We also offer skating on the pond under the stars and romantic sleigh rides. I wish I could invite you to join us this year, but we’re all booked up. The rooms with fireplaces and jacuzzi tubs actually sold out months before. In fact . . . I probably shouldn’t tell you, we take our guests privacy seriously, after all. Then again, I know when you stop by my page you’re hoping for the inside scoop. My cousin Nell, from the Christmas, Colorado series, does it all the time. So I guess it wouldn’t hurt if I shared about several reservations we received earlier this month, all made in the name of Gallagher. That’s right, unbeknownst to each other, my grandsons Liam, Griffin, Finn, and Aidan have all made reservations for this coming weekend. And they’re certainly planning to treat their wives to a wonderful time: breakfast in bed, spa treatments, chocolate fondue for two, and sleighrides in the moonlight. It’s to be a surprise though. Sophie, Ava, Olivia, and Julia haven’t got a clue what’s in store for them. I’m sure the boys will be just as surprised when they discover who’s in the rooms next to them. As I understand it, after swearing their father, Colin, to secrecy, each of the boys asked him to look after their children for the weekend. Little did they know that their father had also booked a romantic weekend at the manor for him and his girlfriend Maggie. So swearing Jasper and I to secrecy, Colin asked if we wouldn’t mind looking after the children for him, which of course we happily agreed to do. Friday evening we’ll be doing an overnight campout with the children in the ballroom and watching “Lady and the Tramp” and “Gnomeo and Juliet” while eating our favorite movie-night snacks. 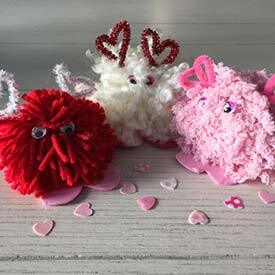 On Saturday we’ll make Valentine Pom Pom Monsters and brownie hearts with the children, followed by an outdoor scavenger hunt.